St. Paul’s Catacombs are the largest and most impressive of all the underground Roman cemeteries in Malta. The first burial dates to the third century BC, and the tombs continued to be used until the 4th century AD. The underground cemetery was beyond the walls of the Roman capital of Melite, present day Mdina; the Romans did not bury the dead within the city walls. 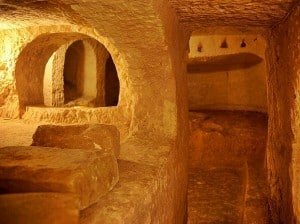 While these catacombs might nothing like the scale of the underground tombs and cemeteries you can visit in Rome, they nonetheless represent the earliest and most significant archaeological evidence for Christianity in Malta. On descending into the cemetery, visitors enter a large underground hall, furnished with the usual rock cut circular tables and platforms used for the funerary rites. A number of tunnels lead away from this reception area to the various tombs. Of these tombs There are seven different types, probably related to social status. These tombs were not only used for Christian burials, Pagans and Jews were also buried here. The network of underground tombs was rediscovered in 1894, when they were cleared and surveyed. Very few artefacts were found during this work as the tombs had already been looted, probably sometime soon after the 8th century AD. A multi site ticket is available for three attractions in Rabat & Mdina: St Paul’s Catacombs, Domus Romana and the National Museum of Natural History. Where are St. Paul’s Catacombs?